Peter Hickman on the Smiths BMW. Peter Hickman may be coming in under the radar somewhat this week at the Vauxhall International North West 200, but the British Superbike contender could soon be grabbing the headlines. A lot of attention will be focused on BSB rider Glenn Irwin, Triangle record holder Alastair Seeley and Ballymoney’s Michael Dunlop, but write off Hickman at your peril. This will only be his third appearance at the North West after he missed the event through injury in 2015, but Hickman has shown enough already to mark himself out as a serious threat in all classes. He is back on BMW machinery in the Smiths Racing team in 2017 after riding the Kawasaki ZX-10R last year. The Burton-on-Trent rider will also ride a Smiths Triumph in the Supersport races in the Iron Maiden-backed Trooper Beer colours and must have a major chance of getting off the mark at the seaside meeting. He finished on the podium last year in the Supersport and Superstock classes and felt a top three result was also within reach in the Superbike race until it was cut short when Bruce Anstey crashed out. “I missed 2015 at the North West so I’ve actually only done two years so far. I finished fourth in the Superbike race last year but it was cut short and I’m fairly confident I’d have been on the podium there too, but I was on the podium in the Supersport and Superstock classes,” Hickman said. “I’m looking forward now to getting the Smiths BMW onto the roads properly, so it should be good. The aim is to make sure I’m on the podium all the time and arrive on the top step – that’s the plan. “BMW have been pretty good and they were really keen to have me back on board. 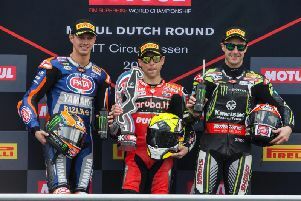 They’ve given us as much technical support as they can and I have also brought my crew with me as well – the same crew I had with me at Kawasaki last year,” he added. Hickman, who won for a second time at the Macau Grand Prix last November on the Bathams/SMT BMW, enjoyed riding the Kawasaki in 2016 but admits the S1000RR is probably the bike to be on for the international road races. “The first two years I didn’t know any different [if BMW suited him best] but I guess we’ll find out this year because I’m swapping back again, so it will be interesting to see what I think – swapping between the two,” he said.